What was the exact path of the Doolittle Raid? I'm trying to find the exact path that the Doolittle Raid took from its rendezvous point near Hawaii to the launch point near Japan. I would like to be able to see this path on a map so I can understand it better. What I've found so far is incomplete information. Wikipedia says that Task Forces 16 and 18 met "in the mid-Pacific Ocean north of Hawaii." It also says that this happened "a few days later" than Apr 02, when Hornet and TF18 departed San Francisco. It only had a cite for that last part. But later it at least gives a coordinate for the launch point: 35°N 154°E , and a time, Apr 18 07:38 (though it did not say if this was local time or some other time). However, there is apparently another point in the path where "On the afternoon of 17 April, the slow oilers refueled the task force, then withdrew with the destroyers to the east while the carriers and cruisers dashed west at 20 knots." It did not give a coordinate for this nor an exact timestamp. I found another source that said a different rendezvous point "just east of Pearl Harbor" on Apr 10. However, I find that source unreliable because it said a Japanese I-Boat unsuccessfully attacked the Task Forces while on the way to Japan, which I have never heard of before, plus it said at the end the "Task Force arrived at the planned launch point without obstruction." which is just plain wrong. The Task Force launched a few hundred miles short of the planned launch point precisely because they were obstructed by a Japanese fishing boat that radioed a warning. I could not find any citations from that website. It appears to be a personal blog. I could not find more data on the details of the path, such as dates/times of rendezvous points. I searched a few youtube docs too, but those are notorious for being 95% worthless recreations and 5% actual data, so I did not find the answer on youtube either. An action report for the Doolittle raid was prepared by Captain George D. Murray of the USS Enterprise (CV-6), and submitted to the Commander-in-Chief, U.S. Pacific Fleet, on 23 April 1942. Most of what follows has been extracted from that report. On 8 April 1942 Task Force Sixteen assembled at Pearl Harbor. The task force consisted of the USS Enterprise (CV-6, Flagship), USS Northampton (CA-26), USS Salt Lake City (CA-25), USS Balch (DD-363), USS Benham (DD-397), USS Fanning (DD-385), USS Ellet (DD-398) and USS Sabine (AO-25). Task Force Sixteen was commanded by Vice-Admiral W. F. Halsey, jr.
After landing the Air Group aboard south of Oahu the task force set a westerly, and then a northwesterly, course taking them 30 miles southwest of Nihoa Island. This course (310° T) was continued with slight modifications until 0600 (Y) on 13 April, when they rendezvoused with Task Force Eighteen at position Latitude 38° 00' North, Longitude 180° 00'. Task Force Eighteen consisted of the USS Hornet (CV-8, Flagship), USS Vincennes (CA-44), USS Nashville (CL-43), USS Gwin (DD-433), USS Grayson (DD-435), USS Meredith (DD-434), USS Monssen (DD-436) and USS Cimarron (AO-22). 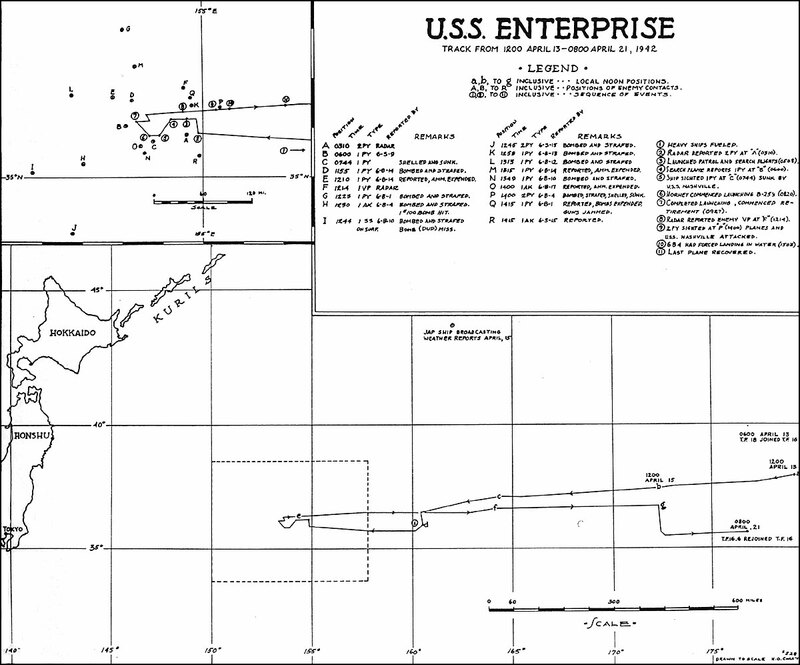 Details of the route taken by Task Force Eighteen can be found in the action report, submitted by Admiral Marc Andrew "Pete" Mitscher, of the USS Hornet. USS Hornet carried the 16 B-25 bombers which would carry out the Doolittle Raid. The two task forces merged under the designation Task Force 16, and set a course of 265° (T) and a speed of 16 knots towards Japan. The heavy vessels refuelled on 17 April, when the task force was about 1000 miles east of Tokyo. When refuelling was complete, at 14:39 local time, the core of the task force (2 CV, 3 CA and 1 CL) set a westerly course and speed of approximately 20 knots towards the launch point. The bombers were launched from the USS Hornet (CV-8) on 18 April between 08:20 and 09:21 local time, approximately 650 miles from Tokyo. The launches are recorded in the Deck Log of the USS Hornet. This would correspond with the approximate position you have of 35°N 154°E. A comment on the action report notes that a track chart (Enclosure (A)), drawn to the scale of H.O. chart No. 528, was included with the report. The original is presumably preserved in the US Navy Archives. What was the US Navy's “fleet marine force” in 1944-45?